On 20mm plastics, the flags from most manafacturers are notoriously bad. Usually too small, with molded on designs (often inaccurate) and wobbly shafts. The first thing I do with plastic colour bearers is replace the flag. Depending on the pose, you can often get away with just chopping off the top half of the shaft, sticking a pin throught the hand into the body of the figure, and adding a flag from paper or foil or whatever. Usually though, the colour bearer is standing with his arm outstretched away from his body, holding the flag in one hand. The easiest thing to do here is push a pin through the hand and into the soft plastic base, giving two solid anchor points. A standard pin is too short, so you need to find longer pins or cut a bit of music wire to length. Since I've got several hundred normal size pins, I thought I'd find a way of using them, this is what I came up with. 1 Cut the head off your pin, and push through the hand of the figure, into the base. Or, stick the pin up through the base then through the hand. The second method is is a bit trickier, but more secure ultimately. 2 Get a piece of brass tube just big enough to slide over the pin, and as long as your flag is tall. 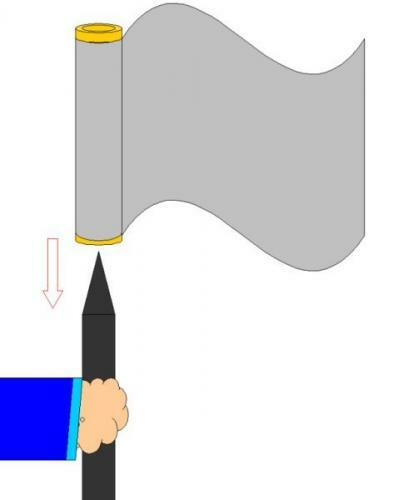 3 Cut out your flag from lead foil. Make it the height you want, but a little wider. Super glue one edge to the brass tube, then wrap a layer of foil around the tube. You can wrap more for an unfurled look. 4 Dribble some super glue down the pin, and drop on your brass tubed flag. Afterwards I thought you could do without the glue, and have interchangeable flags for different units. If you want to go the extra mile, it's also easy to make a little spear head to go on top of the shaft, make it from or on a pin, and it'll slide down the brass tube.